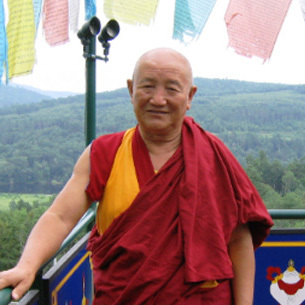 Gyumed Khensur Rinpoche Lobsang Jampa will continue teaching Kadampa Geshe Chekawa’s classic text The Seven Point Mind Training, a course that he began in 2016. Don’t worry if you missed some. Whatever you are able to hear about Mahayana mind training (lo-jong) will be applicable in your life. This is an amazing opportunity to receive teachings on these practical steps, including the very useful slogans of mind training, from such an accomplished and venerated teacher such as Khensur Rinpoche! As one of the last generation of Tibetan Buddhist scholars to begin their educational careers in Tibet prior to the Chinese invasion, Gyumed [pronounced Gyoo-May] Khensur Rinpoche Lobsang Jampa has played an instrumental role in the reestablishment and preservation of Tibetan Buddhist traditions in exile, and in the spread of Tibetan Buddhism to the Western world. 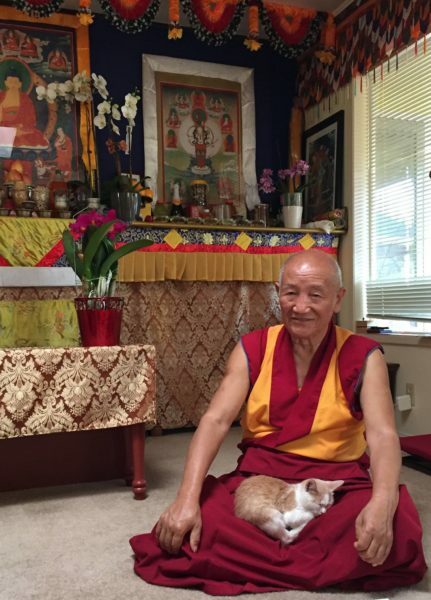 Highly regarded for his scholarship and depth of religious practice, Rinpoche teaches frequently in New York, Washington D.C., and at Do Ngak Kunphen Ling (DNKL), a Tibetan Buddhist center in Connecticut, where he hosted a visit from the Dalai Lama in 2012, and more recently in San Jose, CA. He is abbot emeritus of Gyumed Tantric College, head of Mey College’s Thewo regional house at Sera Monastery—one of the largest Tibetan monasteries in exile—and Spiritual Director of DNKL.